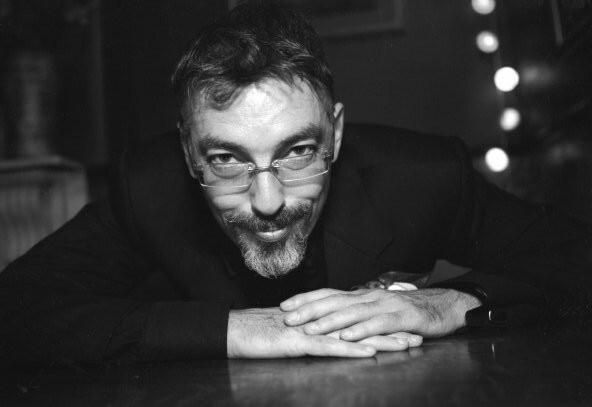 Guest post by John Morgan. John runs R&D programmes at a Sydney startup company. He has a PhD in physical chemistry, and research experience in chemical engineering in the US and at CSIRO. He is a regular commenter on BNC. Let’s get one thing out of the way – the parochial title. Graham Palmer’s Energy in Australia is not about Australia, any more than, say, David MacKay’s Sustainable Energy Without the Hot Air is about the UK. Both books make use of local case studies, but they are both concerned with fundamental aspects of our energy system that will interest readers regardless of nationality. Likewise, peak oil and Asia’s economic growth are minor players in this story, characters that don’t really warrant top billing. So, what is this book really about? EiA is an extended discussion of the high level issues in energy system transformation, in particular, energy return on energy invested (EROEI), intermittency, and electricity grid control. A short, punchy book of only 80 or so pages, it is broken down into many bite-sized pieces and is an easy read for the non-specialist, despite being published under an academic imprint. The book argues that solar and wind exist within the existing fossil fuel / synchronous grid framework, and have a role to play in abating emissions from those plants, and in network peak load support, but that they do not allow us to break out of that system. That would require an energy source with high EROEI driving synchronous generators that can progressively replace those driven by coal and gas in the existing grid. 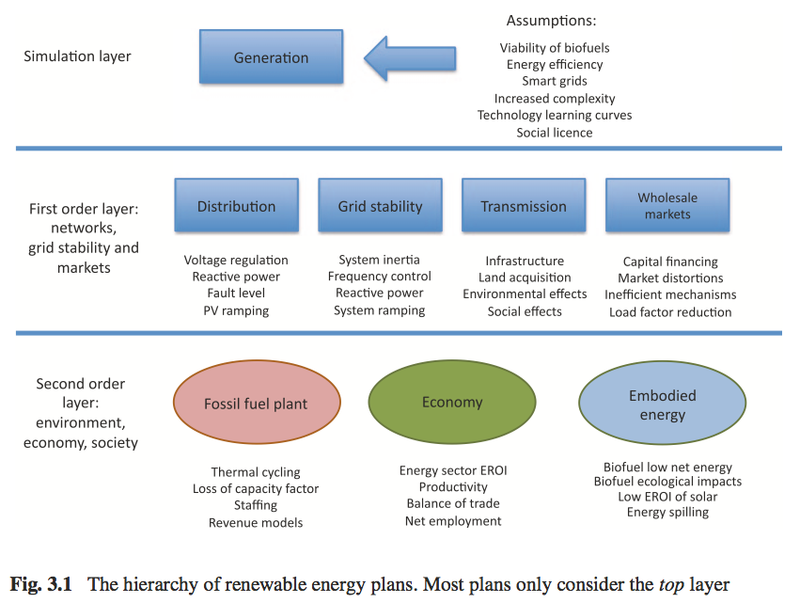 The underlying theme of 100% renewable plans is the assumption that through increased complexity, an optimal set of synergies can be discovered and exploited. The difficulty is that the plans operate solely within the shallow “simulation layer” … With few exceptions, little consideration is given to the deeper first- and second-order layer issues. The first half of the book explores those deeper issues, and is a fascinating description of the operation of the grid, its control schemes, the role of baseload, peak demand management, storage, capacity factors, availability and so on. This really should be compulsory reading for anyone serious about a transition to a low emissions electricity grid. A startling figure from this discussion is the world’s electricity generation mix expressed, not as contributions from coal, gas, hydro, wind etc. as we usually see, but as the fraction from “synchronous rotary machines” – that is, mechanical generators with rotating shafts which are synchronized to the electrical frequency of the grid. 96% of global electricity is provided by such machines. In a sense, we have almost no diversity in electrical generation. These machines are ubiquitous because they offer a solution to the historically difficult problem of grid control – making sure that electricity generation exactly meets demand at any instant. This is done by frequency stabilization – the rotation of all the generators on the grid is synchronized, and as loads are connected to the grid, the rotational frequency drops, which is the signal used to bring on board new generation. The rotational inertia and frequency synchronization of these machines are critical to grid operation. Control problems arise when non-synchronous generators, such as most wind turbines, or non-inertial generators, such as solar photovoltaics, are added. The discussion of this and other kinds of non-obvious wind and solar integration issues, beyond simple capacity and intermittency, is one of the strengths of this book. 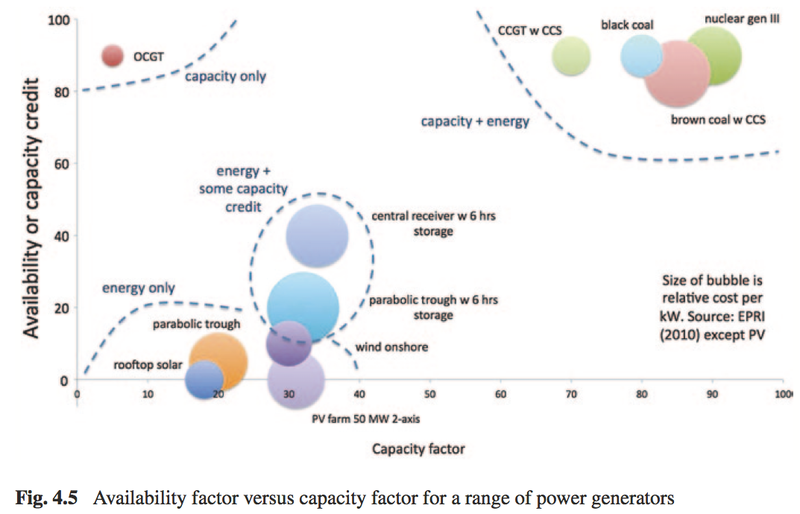 Intermittency can of course be addressed by energy storage, if its available. 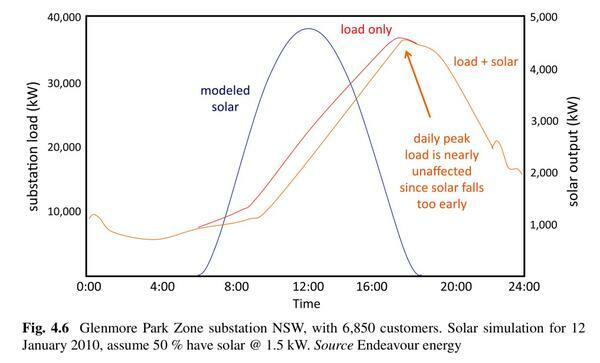 A case study of solar PV in Melbourne shows that solar output is poorly correlated with electricity demand, but with four hours of storage, solar power can usefully reduce peak demand. Palmer concludes that the most useful role for solar PV is peak demand management. In another case study of King Island, an isolated grid with a high penetration of renewables, concludes that the grid control aspects can be technically overcome, but at very high cost. Even when renewables are displacing expensive diesel, which is perhaps their highest value context, the island’s income (from high value exports to the mainland) only covers 39% of the cost of electricity, the rest being subsidized. The focus then moves to EROEI, possibly the most important metric to consider in energy system transformation. It takes energy to build any kind of power plant, so the plant had better be able to give at least that much energy back before it wears out, or the game isn’t worth the candle. If the energy returned just balances the energy used to create it, the power plant has an EROEI of 1. It’s breakeven. And that’s not enough, because it also has to supply energy for the society that builds it. It has to power not just the construction of more power plants, but the homes, roads, schools, hospitals, clothes, cars, computers, armies, movie theatres, farms and all the elements of the civilization in which it is embedded. There is a minimum EROEI required for an energy source to be able to support our present civilization. For countries like the US and Germany, this is estimated to be about 7. An energy source with lower EROEI cannot sustain a civilization at that level of complexity, structured along similar lines. If we are to transform our energy system, in particular to one without climate impacts, we need to pay close attention to the EROEI of the end result. 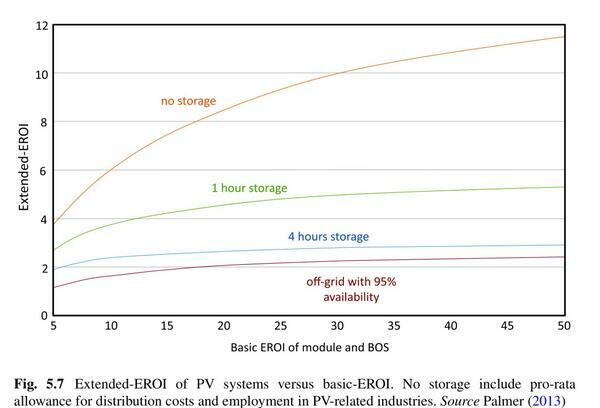 And here an analysis of the EROEI of solar leads to an uncomfortable conclusion: adding storage to solar PV reduces the EROEI, to just above 2. This is not enough net energy to be a viable energy source. Weißbach et al. found a similar result for wind, reporting an EROEI of 3.9 for wind with storage, below the viable threshold of 7. So the idea that advances in energy storage will enable renewable energy is a chimera – the Catch-22 is that in overcoming intermittency by adding storage, the net energy is reduced below the level required to sustain our present civilization. How we get our energy is one of the most pressing questions we face today. Unfortunately the quality of the discussion in the media and elsewhere is, frankly, dire. A wider understanding of the topics treated Energy in Australia is sorely needed, and the book is highly recommended to anyone wanting to understand, and change, our energy systems. 96 % of global electricity is generated by synchronous rotary machines – thermal or hydro plant. “the embodied emissions of renewable generation are not accounted for when ascertaining their competitiveness in the context of a CO2 price. Excellent review. Thank you John Morgan. I apologise to Graham Palmer I haven’t yet read your book, but I have it and it is next on my list to read. The figures for wind (4) and PV (2.3) are close to those in John Morgan’s review (3.9 and “just above 2). Thanks for a meaty, rational, solid and sensible discussion piece. I’m off to Readings to buy a copy of this very important small book. BTW, I’m still confused about the comments policy on this site. The notice that comments should be “above this line” is nonsense, when there is nothing clickable above the line. Following comments threads has been difficult for a year or two. Time for a discombobulation article to get the flow going again. Not available from Readings? Where can this book be purchased? @singletonengineer, follow the first link to Amazon. Kindle edition available, and cheaper, for those so enabled. Sorry but I don’t understand why you are having trouble commenting. I have just typed this in said box. Where are you reading that “comments should be above the line”? “Respond to this post by replying above this line”. It isn’t repeated on the web version. I have checked the email alert and can the see the direction to reply above the line, right at the top of the email, in small letters. If you fully open the email in your screen you will be able to access the “Reply” function on the taskbar. When you click on this it opens a new email with a cursor allowing you to type your comment and “Send”. I have tested this method and it immediately posts the typed comment. However,if you don”t want to fully open the email, you can scroll to the bottom where you have the opportunity to “Comment” or “See all comments” or “Like”. Clicking on the green box “Comment” will take you straight to the BNC post comments. Clicking in the body of the email, on the title of the post, will take you direct to the blogpost, as will clicking on “Read more of this post”. I agree it is confusing but it is probably a function of the email tool and can’t be removed. Thanks for pointing it out. 46 cents per page, even when marked down to 35 via Kindle, is more than I’m prepared to put up. Thanks for the review. At the risk of being drawn over the coals, here is the first of a number of re-blogs from Brave New Climate. Thank you for the clear review. I look forward to reading the book. Several have commented on pricing and availability. I recognize that publishing in today’s world is not a simple matter. I see great value for me in this book, at this price. However, in the broader social context if the goal is to help change the terms of public discussion this information must spread broadly to those who are uninformed-but-opinionated about renewables. The current price presents a major obstacle. It simply won’t get the information to those who are reading Lovins et al who preach renewables as the easy solution and see any objections as conspiracy by gov’t, big oil and king coal, etc. Distribution via ebook (perhaps even ePub instead of Kindle? ), at a low-margin price may enable the book to reach a very broad audience worldwide? Of course I can’t predict whether large sales volume at low margin would generate comparable net revenue to the current price, and I do recognize that authors should, justly, receive a return which reflects the high value of the content they’ve created. Another option for broader global penetration would be to enable / empower an appropriate author/authority in each country to publish an appendix or addendum to accompany the book, with the relevant charts and graphs for that country? How do you propose the author get fairly recompensed for his time and effort researching and writing the book. There is years of practical experience in that book. I imagine that book is well worth a year or two of his pay as a highly valued consultant – I’d guess in the order of $250,000 to $500,000. How does the author get properly recompensed? Peter, I wish you were a publisher deciding author’s fees! On a serious note, the author compensation for technical/scientific publications is usually relatively small, and may often be net-cash-negative when the costs of conferences, purchasing scientific papers (frequently $30 to $40 for a 9 page pdf), books, other costs, etc is included. AFAIK, very few authors of non-fiction technical books would earn enough to make a living. I did it because I think I can make a contribution to an important topic. Graham,”The benefits for the country when people with experience like yours publish contribution like your Energy in Australia, is unmeasurable, IMO. I agree with Jess that it needs to be made as available as possible – especially to policy advisers, relevant academia and media. But how can we do that and still provide fair remuneration to the few people who can make substantial contributions given that these people are busy building wealth for the country in other ways by their consulting, business, managerial direction and other contributions? Catch-22 – not worth doing because the net energy is reduced to below zero ? hmmm – sounds a little like it’s not worth getting up and going to work to earn money or grow food because – oh – the net energy’s not worth it. so – sorry – I don’t buy your Catch-22 – I think energy storage is essential – since humans started storing food for the winter – no question we need energy storage – thank you and good night.